Description: Commonly known as dong quai or female ginseng, Angelica is a large hairy, biennial plant with ferny leaves and umbels of white flowers. It can grow 5 to 8 feet tall, and flowering time is June to August. Aromatic Scent: It is said to have a peppery top note with a herbaceous, earthy, woody notes and a spicy undertones. Common Uses: Also referred to as Dong Quai and Chinese Angelica, in Chinese medicine it is used to relieve cramps, infrequent and irregular periods, PMS, and ease menopausal symptoms. 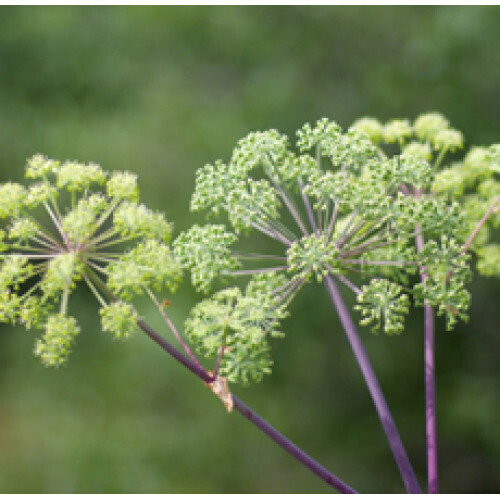 Based on its monoterpene hydrocarbons, Angelica Oil may be antispasmodic, carminative, depurative, diaphoretic, digestive, diuretic, hepatic, stomachic and tonic; however, it has photosensitizing properties as well, and may have properties as a nervine stimulant. Though animal studies had indicated it has the properties for which it is known in China, more studies are necessary to test its safety and efficiency in humans. Also referred to as Dong Quai and Chinese Angelica, in Chinese medicine it is used to relieve cramps, infrequent and irregular periods, PMS, and ease menopausal symptoms. Based on its monoterpene hydrocarbons, Angelica Oil may be antispasmodic, carminative, depurative, diaphoretic, digestive, diuretic, hepatic, stomachic and tonic; however, it has photosensitizing properties as well, and may have properties as a nervine stimulant. Though animal studies had indicated it has the properties for which it is known in China, more studies are necessary to test its safety and efficiency in humans.